Today’s business happens as much outside the physical walls of an office as it does inside them, and more in many cases. With the advent of cloud services, it is now possible to create virtual work platforms of nearly any functionality and price. Usually these services include things like employee profiles, company structure, calendars and scheduling, instant messaging, document management, tasks management, project management, workflow, and more. When a business is fully integrated with such online services, employees become accustomed to working in the corporate online environment, given that it minimizes the need for paper, makes information easy to find, and provides access to colleagues in a way that is not distracting. It is natural, then, that employees would wish to associate with clients, customers, partners and other third parties in a similar environment, though access to the intranet for such people is not possible. This is where the extranet comes into play. By creating a separate virtual “office” for each client which is accessible seamless from the employees intranet, any number of clients can be served in the environment wh ere employees are most comfortable and their work is most efficient. The content of that ‘office’ is limited to only what pertains to the client or third party, whether files, discussions, images, tasks, etc. For example, web studios and advertising agencies can create separate workgroups that are available in the extranet for each project, invite clients to them, discuss the project, store related documents and media files, manage tasks, schedule events, and so on. In a nutshell: group information is accessible only to persons inside the group. 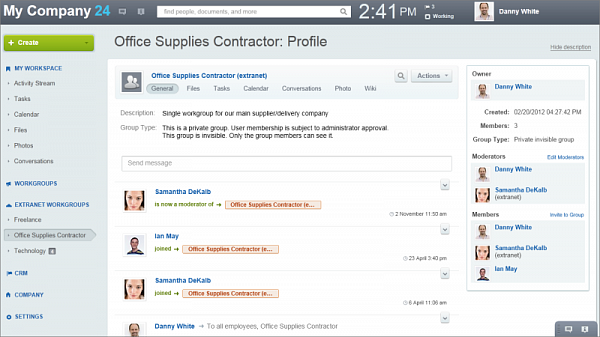 The group consists of employees who receive access seamlessly from their intranet, and third parties who can log into Bitrix24 and see only the group, members of the group, and their own profile. Bitrix24 for an external user. Note that only 1 group is visible. The group is accessible from anywhere via the internet, and from any device (there is already a Bitrix24 app in the AppStore and Play). 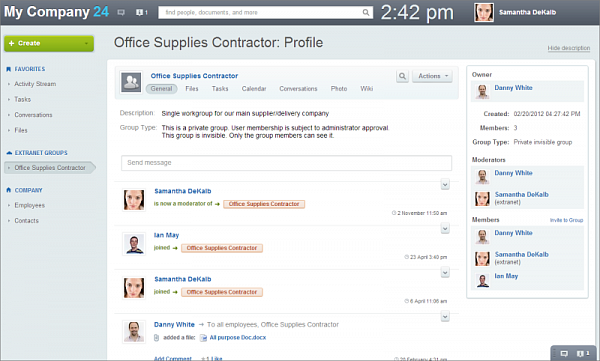 Extranet groups have these functions: Conversations, Files, Tasks, Calendar, Photo, Wiki, Search, and access to the Instant Messenger. Unneeded group features can be disabled. The number of groups in the extranet is not lim ited. External users can be admitted into multiple groups if needed. After a group has completed its work, it can be saved as an archive and restored later if necessary. Would you like to have an office like this? Try it for yourself here.